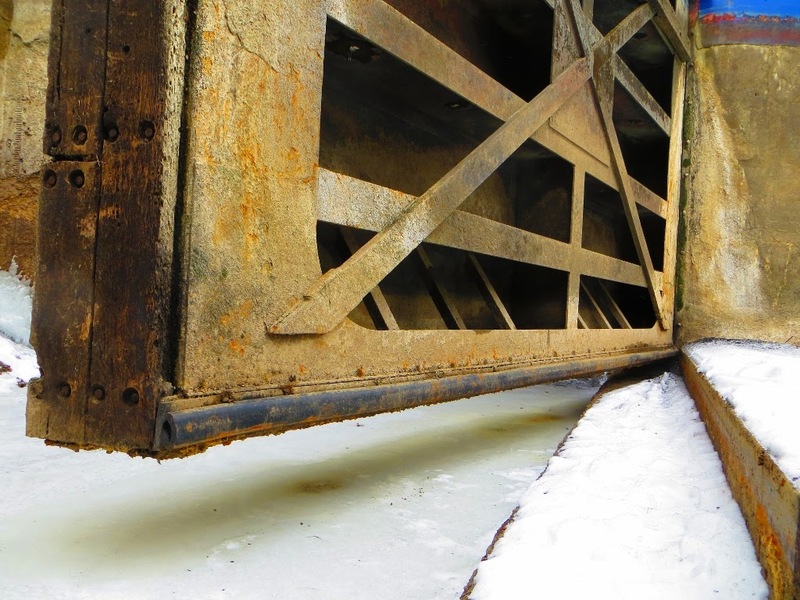 Winter maintenance and repair at Lock E-27 in Lyons provides a spectacle seldom seen by anyone: the lock is drained and the huge, super massive “mitre gates” (lock gates) are clearly visible from the topside catwalk down to the bottom rubber sill seal - the same type of gates used 100 years ago when the lock was constructed. The gates are massive steel structures. 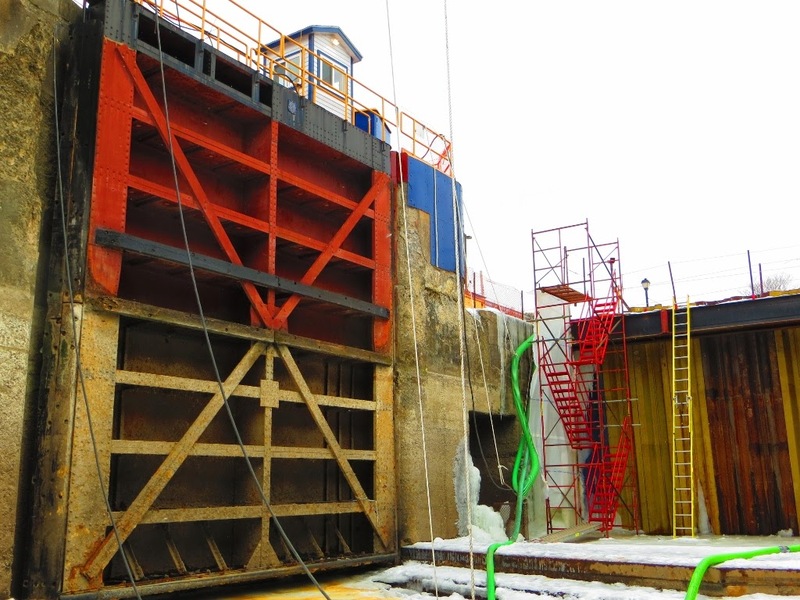 At the upper end of the lock, the gates are 18 feet high, 25 feet wide and 24 inches thick. The gates are taller at the low end of the lock. So how do the gates work? How do they seal water in or seal water out? The operation of the actual locks is controlled by the Lockmaster in the “Operating” or “Control” Stand located directly adjacent to the locks. When a boat has entered the lock, the Lockmaster utilizes an electronic control panel and skillfully closes the locks- “not too fast and not too slow”- just right. Each gate has a circular white oak timber post (quoin) bolted to the anchor or pivoting end of the gate. The white oak timber post (quoin) swings on a pivot mounted in the lock floor, and the top of the timber post (quoin) is attached to the lock wall with two adjustable anchor arms. The Lockmaster swings the gates toward each other and eventually the flow of water into the lock is stopped. The space between the two gates is sealed, and the space at the bottom of the gates is sealed. How does it happen? Lock E-27 utilizes “mitre” gates. The mitre gates close at a slight angle pointed upstream. The seal between the two gates is formed when the massive white oak timbers bolted to the inside edge of the gates are forced together. The seal at the bottom of the gates is formed when the gate squishes a rubber seal against a ledge called “the miter gate sill” (Think “door sill”). The pressure of a minimum 12 feet of water against the gates solidifies the seal or lock. Once the gates have been closed, the Lockmaster moves to the gates at the opposite end of the lock, enters his Operating Stand with all the controls, and continues the historical saga which officially began on May 15, 1918- proudly locking boats through Lock E-27 on the Western Erie Canal in Lyons, New York, Milepost 220.99. This article was part 3 of 3. (NYS Canal Section 6 Superintendent Dan Craine and Lock E-27 Supervisor John Albanese assisted with information for this series). 10 Comments to "Lock E-27 From the Bottom Up ~ Part III "
I think I have really come on the right place for getting the perfect info. Your write-ups are far more than wow! Wow, this article is fastidious, my sister is analyzing such things, thus I am going to convey her. Next page: How To Learn To Lock Files In 1 Hour. Hi, I think that I saw you visited my blog so I got here to go back the favor?. I'm attempting to in finding issues to improve my website! I assume it's good enough to make use of some of your ideas!! This post: How To Learn To Lock Files In 1 Hour.